Guests looking for the perfect gift this holiday season can give the gift that seafood lovers crave – a gift card from Red Lobster! And, now through December 31, gift card buyers will receive a gift of their own with Red Lobster’s GIVE A GIFT, GET A GIFT offer. For every $50 guests spend on gift cards, they will receive a bonus card good for their choice of $10 off or a free appetizer coupon valid on a future visit January 2, 2017 through February 5, 2017. 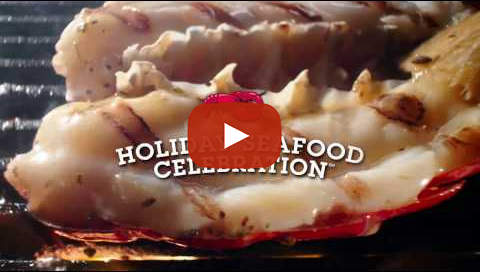 Red Lobster’s holiday gift cards are available in three limited-time holiday designs and can be purchased at the restaurant or online at www.redlobster.com/gift-cards. The eGift Cards can be personalized with a voice message and scheduled in advance for delivery on a specific day. New! Grand Seafood Feast: Maine lobster tail with a white wine and butter sauce, a crab hollandaise-topped lump crab cake, a garlic-grilled red shrimp skewer and Red Lobster’s signature hand-crafted shrimp scampi. New! Wild-Caught Lobster-and-Shrimp Trio: Wood-grilled Maine lobster tail topped with Norway lobster mac-and-cheese, paired with a garlic-grilled red shrimp skewer and panko-crusted red shrimp with Red Lobster’s classic cocktail sauce. New! Crab-Oscar Surf and Turf: Wood-grilled sirloin or New York Strip topped with a mushroom demi-glace and paired with a crab hollandaise-topped lump crab cake. New! Peppermint Brownie Sundae: A warm brownie served with vanilla ice cream, topped with a chocolate peppermint sauce, whipped cream and crushed peppermint candy. New! Blackberry Amaretto Sour: Freshly muddled blackberries, DISARONNO and house sour mix. New! Peppermint Winter Frost: Bailey’s Irish Cream liqueur, Crème de Cacao and decadent peppermint, topped with whipped cream and crushed peppermint candy. To view the complete Red Lobster menu, find a restaurant location or to join the Fresh Catch Club, visit Red Lobster’s website. Red Lobster is the world's largest seafood restaurant company, headquartered in Orlando, Fla., with an impressive heritage and an even brighter future. As a private company owned by Golden Gate Capital, Red Lobster is focused on delivering freshly prepared seafood at reasonable prices - served in a lively, contemporary seaside atmosphere. With 58,000 employees in over 700 restaurants in the U.S. and Canada, and a growing international footprint, Red Lobster is more committed than ever to be not just the biggest seafood restaurant, but the best. To learn more, visit http://www.redlobster.com or find us on Facebook at http://www.facebook.com/redlobster or Twitter at http://www.twitter.com/redlobster.